Veltheimia bracteata being the most widely grown of this small group of South African bulbs. These bulbs are sometimes referred to as the ‘Forest lily’ this gives us an insight into growing conditions. These are shade lovers and much prefer indirect light. Frost can be a problem, especially heavy frosts which will damage the foliage fairly quickly. We have found that Velthemia like to be left alone, once established they are happy to multiply and flower with little trouble, they seem to ‘sulk a little’ after being moved. 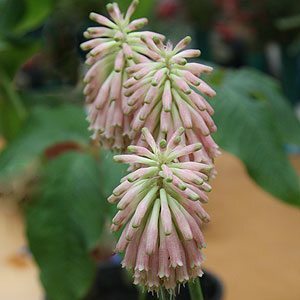 The flowers appear as pink spikes and rise well above the glossy green foliage. They grow well in shade so are suited to planting beneath large trees where they add colour at an otherwise dull time of the year. The flowers are long lasting, around 4 weeks is common. Velthemia can be grown easily in pots and containers and work well as an indoor plant, they hold their flowers over a long period. Flowers will begin to appear in early winter and open up mid to late winter. 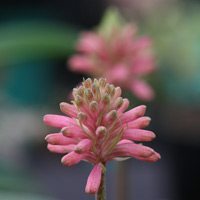 Veltheimia should be planted at ground level, the base and roots in the ground but with the top of the bulb above the ground. We grow them in pots in a shade position where they do well, as well as in the ground at the base of Southern Beech Tree. We use a liquid seaweed fertiliser in spring as they begin to show signs of life. Larger clumps can be divided in summer as the bulbs go through their short dormancy. Plants can also be propagated from seed or by leaf cuttings placed in a sharp sand. Plant in good soil with the top of the bulb just above the soil level. When the foliage is in active growth, water during dry periods. Fertilise with a liquid fertiliser when in active growth. Cut back on water as the plants enter dormancy in summer. Veltheimia capensis is a different species that grows well in full sun. Flowers – Pink to rosy pink although colour is variable.